If you have any question(s) not listed below please contact us via our Help Desk (members) / Contact Us (non-members). Q) Do you offer medical advice? We are not a medical advice web site. If you are seeking advice for an illness or injury, please contact your healthcare provider. We are a networking community for nurses, nursing students, and educators. Q) Do you charge for membership? Membership is completely free. But, we do offer Paid Memberships for those who wish to personalize their experience on the site. To learn more about our membership visit Need More Options? Upgrade! Q) Can we use your cartoons on our site? You are free to share our cartoons on your website or social networking account as long as you don't make changes to them. If you want to use for anything else please contact our Contact Us . Q) Can we promote our website/product? Please do not post messages on the site that are primarily for promotion or advertising of any website or products (ie. no self-promotion). If you have a product or website that you want to promote please contact our Contact Us . Q) How can we get listed in your (Schools/Products) Directories? Our goal with our directories is to provide enough information to empower our readers to make a decision. We do this by providing a detailed overview and allowing our members to share their own experience/review. If you would like to add your school please submit a request via our School Directory Request form. If you would like to add your product please submit a request via our Product Directory Request form. 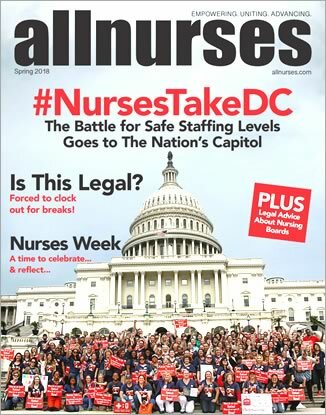 Q) How can we get our products listed in the allnurses Magazine? The best way to have your product considered for publication in allnurses Magazine is to submit your product for inclusion in our Products Directory. We select products from there for inclusion in future issues of our magazine. Q) Can you delete my account? You can submit a request to remove your personal information. Rename the account to Guest or Anonymous. Once an account is closed it cannot be reopened. IMPORTANT: It does not include removing posts (ie. Topics/Comments). Whenever we remove posts it disrupts conversations on the site. The community gets upset because they took the time to participate in your messages. Q) How do I delete my posts? Only staff can delete posts. Deletion requests are not always granted as it disrupts the continuity on the boards. There are exceptions including removal of personal identifiable information. To maintain your anonymity, we will consider removing or editing the topic. If you would like a thread/post removed please Contact Us with your request. State a reason for deletion and staff will get back to you. Q) How can I reset/change my password/user ID? You can use our Lost Password Recovery Form to create a new password. Upon submission, a new password and your username will be sent to you using the email on your account. If you experience difficulty with this, please contact the Contact Us . To change your password/email/user name, you must log into your account first. Look for your username in the upper right-hand corner of any page. Click on it, then click SETTINGS or DASHBOARD. On the next screen click the dropdown menu arrow on VIEW ALL ACCOUNT OPTIONS. Scroll down the list and click EDIT LOGIN / PASSWORD. Enter your current password, then follow the directions to make changes for password, email address and/or user name, scroll and SAVE CHANGES. If you are on mobile and want to make a change, look in the upper right of any page to find 3 horizontal lines (MENU). Click that and scroll to the bottom of the page to make changes under ACCOUNT. Or look for ACCOUNT link. If you have problems making the changes yourself, please post a confidential ticket via the Admin Office. Look to the left and click: Add Your Topic Now! Include any details necessary to make changes. To request a username change, please submit 3 unique usernames of your choice, and we will be happy to do this for you. The Admin Office is a private forum just between you and the Administrators. It is not a public forum. Q) How do I cancel my Paid Membership (Recurring Subscription)? You can cancel your Paypal recurring subscription via the Membership Upgrade page. If you want to CANCEL a subscription just click the Cancel Status link. You will be taken to your Paypal account with instructions on how to cancel. If that doesn't work you may cancel directly through Paypal.